There are hit records. And then there are blockbusters. One of the world's best-selling records, a winner of two Grammy Awards, an era-defining reference statement, an MTV favorite, and a set that catapulted an already-acclaimed band to arena status, Brothers In Arms is the kind of epic spectacular that comes around only once or twice a decade. Surpassed only in fame and visibility during the period by Michael Jackson's Thriller, the 1985 album remains idiosyncratic for its covetable combination of adventurous songwriting, precision-based performances, and reference-caliber fidelity. 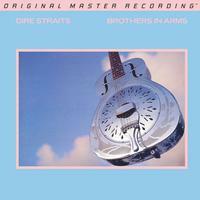 Mastered from the original master tapes, and possessing a richness befitting the album's stellar reputation, Mobile Fidelity's numbered limited-edition Hybrid SACD of Brothers In Arms breathes with transparent highs, atmospheric heft, and lifelike tonalities. The sense of realism this edition delivers will leave slack-jawed even the most hard-to-please audiophiles. As the recipient of the Grammy for Best-Engineered Recording, the album has always been a go-to sonic standard, but never has it sounded so reach-out-and-touch-it realistic as it does here. Although it's easy to speculate that the colossal success of Brothers In Arms relates to its timing — its release during an era obsessed with catchy singles, flashy MTV videos, and whistle-friendly melodies — reasons for the album's chart-busting success primarily owe to the expertly crafted songs and memorable playing turned in by a group hitting its creative peak. Not to mention the spatial dimensions that cause instruments and vocals to naturally float in a fixed area. Anchored by "Money for Nothing," a caustically themed smash immediately identifiable via Mark Knopfler's resonant finger-picked guitar riff and Sting's "I want my MTV" vocal refrain, Dire Straits' fifth album is stuffed with bluesy signatures, jazz-rock motifs, clever lyrics, and organic accents. Diversity and consistency also extend to the songs' moods. Singing with his trademark light-to-the-touch timbre, Knopfler conjures feelings of poignancy, peacefulness, and mellowness, channeling wistfulness on the Top 10 single "So Far Away" and somber assurance on "Why Worry." Customer Reviews (5.00 Stars) 4 person(s) rated this product. This is the best sounding BiA. Trust me, I have them all. The original 1985 CD release of this album was the first CD I ever purchased. It has always been a favourite and over the years I have grown to like it more. As my sound systems have been improved over the years I’ve been able to enjoy the Sonics even more. I made the mistake of buying the 2005 20th anniversary SACD. One of the worst remasters I have ever experienced but this was when I discovered the awful truth about why remastered CDs sounded so bad. Over brightened and the original dynamic range compressed from 20 down to a stupid 8. This killed the crank-ability of the album and causes listener fatigue. Despite all this I took the gamble on the MoFi version because they usually do a good job. It paid off! Their version is true to the 1985 CD but with the extra definition you would expect from SACD. NICE! Glad I took the plunge. I think the original CD and the Mofi SACD are both very good and frankly I like them both equally for different reasons. Don't hesitate on this one, get it before its gone...great sound and finally I can dump my 3-4 vinyl copies. I had no idea this record was edited down to fit the LP, so I finally get a chance to hear this record in its entirely.